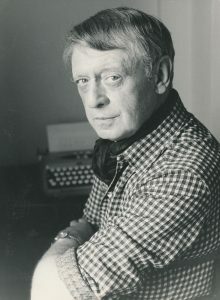 Anthony Burgess visited Australia in 1970 to open the Adelaide Festival, an occasion that brought much calamity. Even before they disembarked the plane, Liana Burgess had a giant stuffed elephant she had bought in Bombay confiscated by Australian officials (Burgess supposed its body must have been stuffed with ‘syphilitic bandages’). She also did not have the correct visa for entry, and was eager to leave the country before she had even properly arrived. Further bad luck ensued when Burgess quoted from Drayton’s verses to the Virginia pioneers, angering his audience who saw him as condescending. These experiences soured Burgess’s view of Australia, yet the country made a lasting impression. In his 1980 novel, Earthly Powers, Kenneth Toomey visits the country, and is impressed with its beauty, even as he struggles with the Australian language. This piece, originally published in the Australian Book Review in 1966, shows Burgess grappling with the Australian language to both comic and offensive effect.